This is an area thrumming with ghosts and geological intrigue and an eventful storybook history – from famous rebels (Te Kooti) and celebrated writers (Sylvia Ashton-Warner, Katherine Mansfield), to infamy (bootleg grog, murder) and legend (moa bones and floating islands). Before the old coach road was shifted further west in 1893, travelling from Napier to Te Pōhue required 43 river crossings along the Esk River route. From Napier to Taupō was a three-day journey with overnight stops at Te Pōhue, Tarawera and Rangitaiki. By 1913 automobiles had replaced horse-drawn coaches, and Te Pōhue Hotel provided luncheon (notified by carrier pigeon) on what was then down to an eight-hour haul, still hazardous, still steep, but increasingly busy, with up to six vehicles a day passing through! 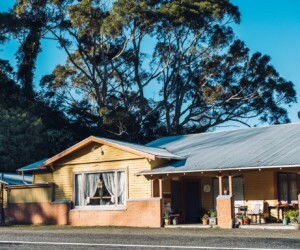 In the 1980s, Te Pōhue was a rest stop by a lake with black swans before an arduous, invariably car-sick journey to the (now boarded-up) Summit Kiosk tea rooms by Turangakumu (halfway!) on the Napier-Taupō highway. In a 1980s childhood, Te Pōhue was also the turn-off across farmland to Camp Te Waka, with its tremendous rocky outcrops, waterfall and mysterious, dense bush – a remnant of the vast red beech forest that once covered this area. Now the lake (on private land) is set back behind willows, and Te Pōhue is a smooth north-west curve on a wide sealed road through a panoramic sweep of rolling paddocks and various stages of plantation pine – from the cornbraid rows of baby trees to ravaged, clear-felled hills. But it’s worth turning off the highway for a moment to explore this hamlet nestled ‘in the shadow of Te Waka’ – the awesome ridgeline to the west that meets at the Titiokura pass with the Maungaharuru ranges in that dramatic run of road down to the vertiginous Mohaka Bridge and across up to Te Haroto and beyond to the highest point on the journey, Tupurupuru (908m). The former Te Pōhue or ‘Lake View’ Hotel, now a private residence. 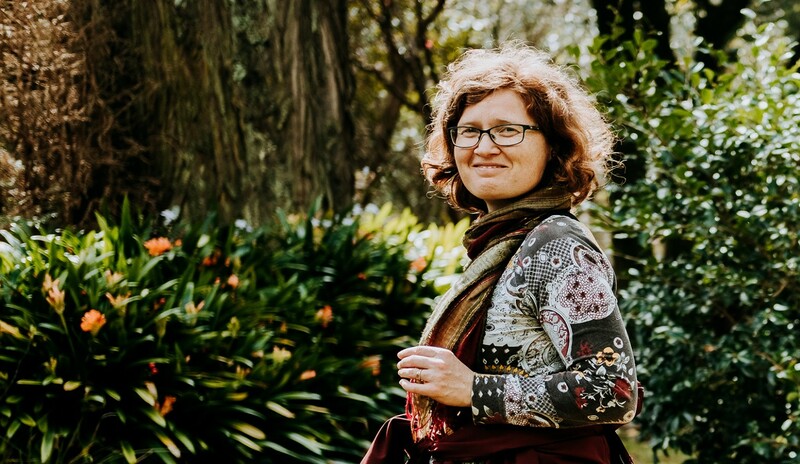 For this is an area thrumming with ghosts and geological intrigue and an eventful storybook history – from famous rebels (Te Kooti) and celebrated writers (Sylvia Ashton-Warner, Katherine Mansfield), to infamy (bootleg grog, murder) and legend (moa bones and floating islands). Te Pōhue is located directly on an old Māori walking track from the interior of the island to the coast. A track taken by William Colenso in 1847, the first recorded European to do so, and upgraded to a road in 1869 by the Armed Constabulary when the Napier-Taupō route became strategically important. 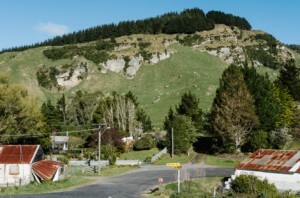 Five garrisons were built along it in order to contain the Pai Mārire movement for Māori self-determination, the so-called Hauhau or ‘native threat’. When the Armed Constabulary built their stockade at Te Haroto, a major Ngāti Hineuru village, they were after the resistance leader Te Kooti, who, it is said, was sheltered numerous times by the hapū right under their noses – he himself named their meeting house, Rongopai (peace). By the turn of the 19th century it was a bustling timber town. 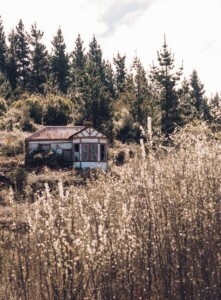 Now that the forests have gone, it’s pared back to the marae and a cluster of homes, several old wooden houses abandoned to the bracken and long grass. While Te Haroto and Titiokura each got a military blockhouse, Te Pōhue got a pub, which burnt down in 1897. Its replacement blew down in a gale; the third collapsed in the 1931 earthquake; the one left standing has closed. It had better luck with its school, which is still going strong. Curiously no church or cemetery. In its heyday as the closest native source of timber to Napier, it was a thriving community – when the natural resource was exhausted, the place declined, along with the birdlife that had once been so prolific. In pre-European times Te Pōhue was occupied seasonally. Kereru were plentiful, as well as mutton birds (titi), and once upon a time, moa (an almost complete skeleton was found here in 1910). 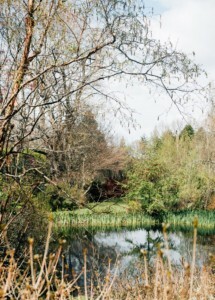 At the time of the Ahuriri land purchase in 1851, which opened up the area for European settlement, iwi had sought to reserve 500 acres of the Pohui Bush beside the lake as a bird-snaring ground (a condition neither formalised nor honoured). 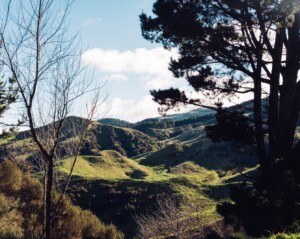 With the bush cleared and much of the steep surrounding land, with its friable soils, poor for farming, Te Pōhue pioneered radiata pine in the 1920s. Following torrential rains in the ‘30s that led to severe erosion, Esk Forest was planted in 1948 to stabilise the hills. It’s one of our ex-state forests, owned now by Forest Enterprises under Pan Pac, and about four years away from ‘peaking’. 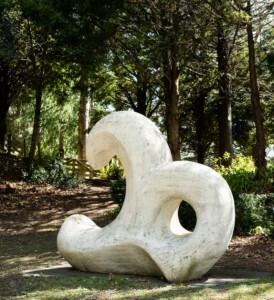 Before the Te Pōhue golf course (established 1967, and famous for its browsing sheep on the fairway), look out for the Old Coach Road, which will take you 5km through Esk Forest to Trelinnoe Park, one of the largest private gardens in the southern hemisphere, with a huge collection of rare and exotic plants, totara topiary, stone cherubs, sculptures. The land was ‘broken in’ for farming in the 1950s by the Wills brothers, the first tree planted in 1960. It’s for sale, but apparently still open to the public. For two hours we strolled the 12 hectares of landscaped gardens, following paths named ‘Walk of the South Wind’ and ‘Vale of Xanadu’ to Daffodil Fields and the Bridge of Reflection. We didn’t see a soul, though we heard the nearby sounds of forestry and farm dogs.